Meet En Sabah Nur. This weekend at Comic-Con 2015, director Bryan Singer debuted the first two minutes of raw footage in Hall H from the upcoming X-Men: Apocalypse (which has only been filming for 5 weeks). While I wish that was out for everyone to see, in the meantime we have the first teaser poster for the movie, and it's all about Apocalypse, played by Oscar Isaac. 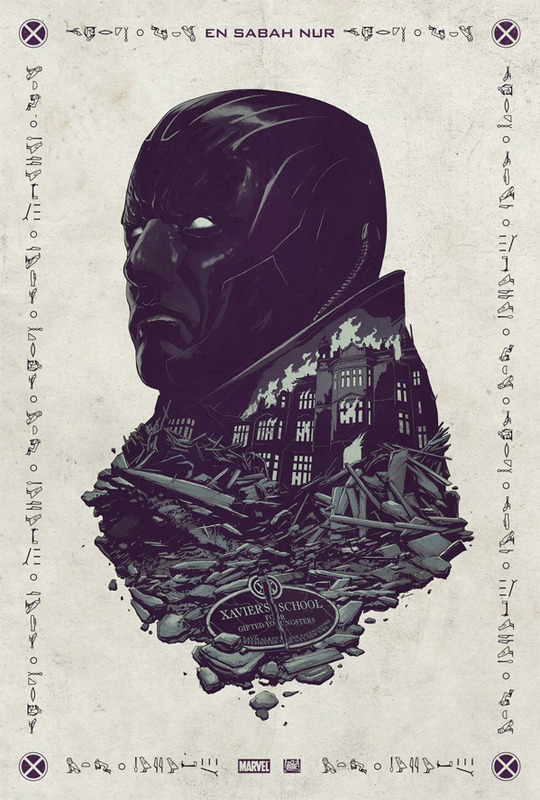 The immortal supervillain from the comics series is known as the very first mutant, from thousands of years ago, hence all the symbols around the poster's edge. Just wait till you see what Isaac actually looks like in the film. For now take a look below. Here's the first teaser poster for Bryan Singer's X-Men: Apocalypse, as revealed by Singer on Instagram. X-Men: Apocalypse is directed by Bryan Singer (X-Men, X2, X-Men: The Last Stand, X-Men: Days of Future Past), who co-wrote the script with Michael Dougherty, Dan Harris and Simon Kinberg. Plot details are scarce, but we know the comic book villain Apocalypse will be the antagonist, and we'll see Alexandra Shipp, Sophie Turner, Tye Sheridan and Kodi Smit-McPhee join the team as Storm, Jean Grey, Cyclops and Nightcrawler respectively with James McAvoy, Michael Fassbender, Jennifer Lawrence, Nicholas Hoult, and Rose Byrne all reprising their franchise roles. X-Men: Apocalypse arrives in theaters on May 27th, 2016. Very cool. Dig those fake hieroglyphs.